Yes this video is a year and a half old, but it's so unbelievably awesome that I had to share it in case you hadn't seen it. Basically, it's seven minutes of pianist Richard Grayson (yes) playing the Imperial March from Empire Strikes Back in the manner of Beethoven. It's beautiful and exceedingly impressive in its reimagining. That sound you hear at the very end? It's John Williams weeping and putting a gun in his mouth.Thanks to Brandon M. for the tip. Many thanks to Videogum editor Gabriel Delahaye for having the balls to reveal the truth all others fear to blog: Christopher Nolan's Inception was nothing but a Scrooge McDuck ripoff. 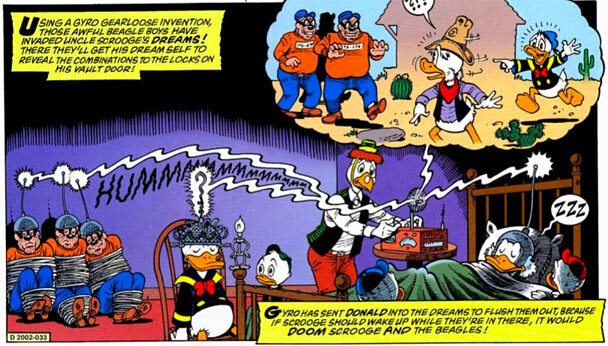 Read the full, original comic here: Uncle Scrooge in "The Dream of a Lifetime"